If you know me, you probably know that I value efficiency a lot, and that I am constantly innovating to bring the most cutting edge French learning methods to my clients. I have collected for you eight things you can (and should!) 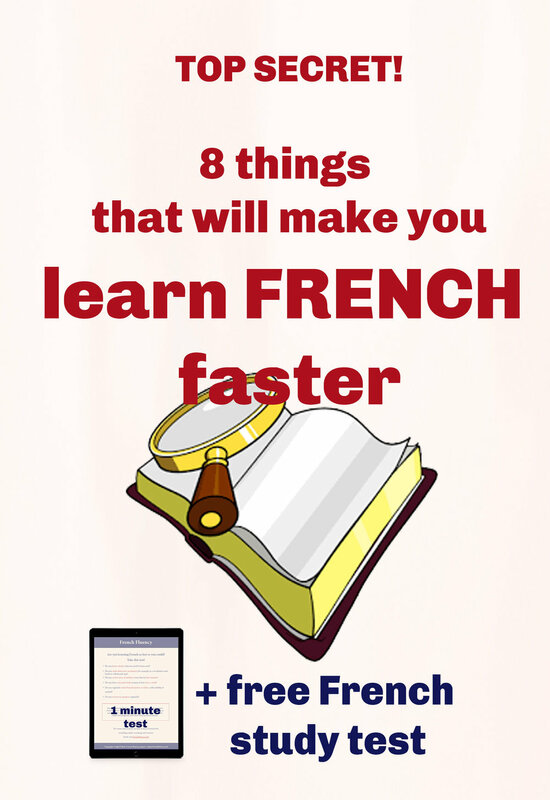 do to learn french faster, without having to find more study time or change the way you study. "Content beats method every time"
In other words *what* you learn matters more than how you learn it. Start with learning the words and structures that you will use the most, and refuse to waste time on all the useless bits. Whenever you find a new word or a new structure, ask yourself "will I use it? How often?" - only learn it if the answer it "yes! very often." If the answer is "maybe... you never know", discard it without regret. You will find that it's much easier to learn your vocabulary when you start using this method, just because you have fewer words. Those "you never know" words should only ever be learned by people who are already able to have conversations in French. Do yourself a favour and upgrade your diet to include more salad, fruits and vegetables, proteins and food supplements if you need them. It's not only good for your health, it's good for your French learning too: You will find yourself more focused, more motivated and your memory will work better. My favourite tip! I can honestly say that sleeping is my #1 priority. Do you sleep enough? Adults typically need 7-9 hours of sleep every night. If you sleep less than 7 hours, you are probably sleep deprived. The consequences of sleep deprivation are bad memory, low motivation, a higher risk of eating unhealthy food (see above), a number of health risks and overall decreased productivity. Even one night of bad sleep will negatively affect your performance on the next day. However, you will only notice it if you know what your performance looks like, when you have actually slept enough. If you have to choose between spending two hours learning French in the evening, and sleeping earlier to get all the sleep you need, go to bed. You can learn a French at virtually any moment. Prioritize your sleep, and your French learning sessions will have a much better outcome. Note: If you struggle to maintain an efficient French learning routine, I have what you need. In my popular one-on-one service, Your Roadmap to Fluency, I create the perfect French learning routine just for you - and much more! Click here to check it out. Ok, ok, I'm not your mom to tell you what to eat, when to sleep and to exercise more, but please hear me out. First of, Time you spend exercising isn't lost for language learning, since it's a perfect moment to multitask and listen to a podcast or audio lesson as you run, lift weight, stretch, etc. Second, exercising is excellent for your body, and your brain is part of your body. People who exercise regularly (like me) routinely experience creative thoughts and a better mood during and after exercising, and find themselves more motivated and with more energy to tackle their other tasks (such as learning French). Don't shy away from exercising out of fear that it will exhaust you. It's quite the opposite. - Purposely save your willpower by removing unimportant decision making from your day. For example, I don't really care about clothes, so I wear a similar outfit everyday and all my clothes are interchangeable. This way I avoid having to decide what to wear in the morning. I also routinely prepare meals in advance, so I eat what's in the fridge, rather than considering what to eat three times a day. And I keep my willpower for important decisions which affect my life positively, such as studying. Everyone of us as a time of the day when they are more productive. Are you an early bird or a night owl? You certainly know if you work better in the morning or in the evening. If you're an early bird, you should aim to schedule your French learning session in the morning, before getting caught up in your day. If you're a night owls, on the contrary, you should schedule your French learning in the evening, when your focus is higher. If you are a night owl, make sure that you will still have willpower available when your productive time comes. I am an early bird, and therefore I always schedule all my important work in the morning. 1) Increased focus. Since I meditate everyday, I have more clarity and almost never feel overwhelmed anymore. I have a much easier time focusing on what matters the most and shutting up the fear or missing out. These are all things you need to learn a language successfully. 2) Liberation from your thoughts. It will be easier for you to think in a foreign language if you are able to control your existing thoughts first. Since I meditate, I find it easier to code-switch (polyglot slang for "change the language I'm speaking") and changing the language of my thoughts at will than ever before. You can get these benefits with just 5 minutes of meditation a day (that's what I do). It's totally worth it. I haven't tried this one yet, but it's definitely on my bucket list. Stephen LaBerge, Ph.D. , author of Exploring the World of Lucid Dreaming dedicates a chapter of his book to the use of lucid dreams as a "rehearsal for living". He suggests that Lucid dreaming can be used to practice both physical skills and mental skills. I know from personal experience that it is much easier to speak a foreign language in a dream (even a non-lucid one) than in waking. While you dream, the rational part of your brain is disconnected. This is the one that says things such as "I can't, my French is not good. I'm shy. I'll make a fool of myself. What if I can't speak at all?". Suddenly, you can and you do speak. This leads me to believe that lucid dreaming is a giant practicing field for French learners, albeit an unconventional one. And as author Stephen LaBerge points out, we have every night to practice! If you have experience with using lucid dreaming as a language learning tool, please send me a message, I would love to hear about it and learn from you. Your turn! Have you tried any of these tips? Do you know any method or trick to learn faster which I haven't mentioned here?